The bamboo joint is an effective shape, that cannot directly be cut. But because of its compactness and the shared liberties of the four stones, there are only 10 liberties in total, for an isolated bamboo joint. 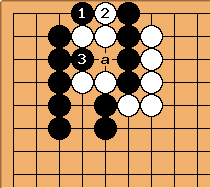 To maintain a connection against a push involves losing two liberties in gote. (Don't take away your own liberties?) This implies that bamboo joints can be attacked using shortage of liberties: for example by setting up a connect and die. Scartol: Bamboo joints are not invincible, as I found out. I played and felt incredibly proud of myself for breaking through to my formerly dead group. Black to win the capturing race. The hane at threatens a connection, followed by the atari at . 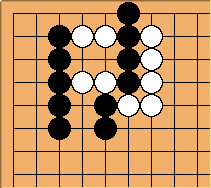 This exploits a shortage of liberties in the bamboo joint, and White is unable to play at a. (Sebastian:) Does this prove that the bamboo joint is as strong as the linear joint (or whatever it's called), because whoever moves first wins? Bill: It's called a pole connection. DJ I'm afraid I do not quite understand your question. A bamboo joint is as strong as the liberties it has, taking into account the inherent possibility of damezumari - see the examples. (Sebastian:) Yes, you did understand and answer my question. It just wasn't obvious to me that they had the same number of liberties. Ellbur: The bamboo joint may have fewer liberties than the linear joint. See Scartol's example at the top. (Sebastian:) Scartol's example is great to illustrate the cautionary tale of this page, but I don't see an obvious way to compare the liberties with those of a pole connection. 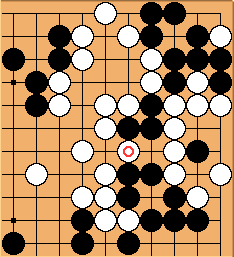 (1) There is no equivalent to the situation in the diagram since the threat of W's circled move wouldn't even be possible. (2) So, what would be the equivalent pole connection? We can choose a pole with any number of liberties >0; depending on that choice you get different answers. (3) What exactly do you mean by "liberty"? symplicity: I too don't see an obvious way to compare the two. I mostly interpret this statement as a warning that even though a bamboo joint may "look" like it has a lot of liberties, because of the space in the center, it might not, for tactical purposes. Basically, one should be aware that the liberties in the middle can vanish very suddenly when the opponent's threat to cut is sente. And as in problem 2, the opponent can also wait for the opportune time to do so.